Access to clean, safe water is vital for people to stay healthy and to flourish. Yet over 1 billion people world wide do not have the safe water they need to drink. Lack of clean water leads to children becoming ill, or dying, from preventable water-related diseases like cholera, typhoid and diarrhoea. In rural areas, women and children, usually girls, miss out on opportunities to earn a living or go to school because they spend most hours each day walking miles to fetch water. In towns and cities, existing water and sanitation facilities are struggling to cope with the ever rapid increasing urban population growth rate. 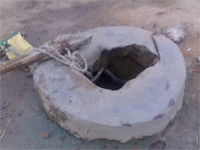 Many households have access to only very basic latrines – or have none at all. Private vendors sell water at high prices to those unable to fetch their own. In Zambia, less than 40% of households have access to adequate water and sanitary services. Women have testified that they walk between 30 to 60 minutes, 4 times a day to collect water. Being able to collect water in minutes, not hours, means more time to earn an income for the family. Moreover, having a safe water supply, adequate sanitation installations and basic hygiene sensitization are essential to reducing cases of water borne diseases. If people are stronger and healthier, they have more time to spend in the field. With increased productivity and less medical bills to pay, the family income will increase. Public awareness meetings and training workshops for water and sanitation committees on basic hygiene, ecological sanitation and water wells management-10 awareness meetings have been held and 5 training workshops have been conducted. RFDP protect water sources and will forge ahead to build more new wells in communities to form more water and sanitation committees that will be responsible for the welfare of the wells in villages. Volunteers will be identified to spearhead the work at village wells. RFDP will continue to train committees to look after the new wells and keep them in good working order. Volunteers are trained in good hygiene and sanitation and are encouraged to pass their knowledge onto others to improve the health of their whole village. Unprotected Drinking Water source for most of the people in the local communities in Lundazi Disitrict. b) Mobilisation of community members to actively take part in the community led Total sanitation (CLTS) (including targeting of beneficiaries and leadership training). c) Sensitize and conduct awareness meetings to the target communities and schools on attaining open defecation free status, safe hygiene practices and improved sanitation technologies. d) Conducts transect walks, community village mapping with community members to areas of open defecation to illustrate the faecal oral transmission routes.